Welcome to the new Boom Nutrition Kit Club. We totally redesigned the Boom! Team Kit and welcome all of our fans to show off our new colors. We partnered with Artletic Apparel and are presenting a new Tri Kit (top and shorts), new Bike Kit (Jersey and shorts or bibs) and a new Performance Tee. All in both mens and womens sizes. Join our Kit Club by buying and racing/training in our great looking kits and in addition to the kit, all members will receive a discount code for a 25% discount on all great tasting CarbBoom! 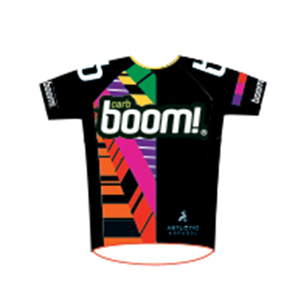 Energy Gels throughout 2019 plus will receive one of our new-look Boom! water bottles as well. All orders placed in our initial rollout by March 1 2019 will get a 10% discount off pricing listed below. Simply use using Coupon Code BOOM when checking out. Fit kits are available, so email us at kit@boomnutrition.com to schedule a try-on or ask any questions. Crafted with the highest care from a strong, lightweight lycra. Boom! Elite cycling bib-shorts are men’s and women’s specific. Top-of-the-line men’s 4-D chamois and style has more support panels. Made from a super compressed and non-see through Lycra. The women’s bibs comes with the EXCLUSIVE Artletic women’s chamois for the ultimate in comfort. The women’s bibs are also designed to fit a women’s body and come with longer grippers for the best fit ever. Boom! Expert cycling shorts are men’s and women’s specific. Top-of-the-line men’s 4-D chamois and style has more support panels. Made from a super compressed and non-see through Lycra. The women’s shorts come with the EXCLUSIVE Artletic women’s chamois for the ultimate in comfort. The women’s shorts are designed to fit a women’s body and comes with longer grippers for the best fit ever. Compression fit and comfortable for swimming, cycling and running. They have two pockets in the back and the fabric is water resistant. Multisport tops sizing fit small. Compression fit for swimming, cycling and running. Comes with tri specific chamois for comfort on the bike, yet comfortable for running and swimming. Performance tees are great for running in or just proudly showing your Boom! loyalty. Unisex and made from a lightweight moisture wicking material. When placing your order, you can choose to have your shipment sent directly to you for a small charge, or if you choose “Local Pickup”, your kit will be shipped to the Boom! office and we will distribute from there.